Drivers Education Blog > Teen Driving Tips > Is Commentary Driving an Effective Driving Technique? Congratulations on having a teen driver! This is an exciting time for your student, but often a stressful time for you, as their parent. You’ve done your homework in researching driving schools and new driver training techniques, educating yourself on how you can best help your student become a good, safe driver. As good as your intentions are at imparting the best driving tips and advice onto your student driver while out on a training drive, sometimes you’re doing more harm than good. If you’ve gone out on any training drives with your student, you know how tense and uncomfortable it can be for both you and your driver: your student is nervous and you’re unintentionally adding to their uneasiness through barking commands and criticism. Instead of shouting out commands to your student and harping on their mistakes, why not be quiet and instead praise them for what he or she did right? This is what’s behind commentary driving. As the name implies, there is a conversation, or series of comments that are said while out driving with your teen. Contrary to what you may think, it is your student, not yourself, who is doing all the commenting. For this driving technique to be effective, parents are discouraged from saying much during the drive. The comments said by the student are to be their observations of the surrounding traffic conditions. The comments can be short phrases and incomplete sentences. Your student needs to say their observations out loud. The more descriptive and specific the student’s observations are, the better. If your student doesn’t say anything, ask them why, what they are thinking about and how they would have handled the situation differently. The only time you should speak is immediately after the student makes a noticeable mistake. Right after the mistake has been made, tell your student to safely pull over onto the side of the road and briefly go over what went wrong. After the drive, go over the whole drive with your student, praising him or her for what they handled well and asking them what they learned from their mistakes. It is crucial that during this time you ask your student to give a self-assessment on how they think they did and wheat they learned. As a parent, the most important things you want to come out of each training drive are an increase in your student’s confidence in their driving abilities and an improvement in their familiarity with operating a vehicle. Both desired outcomes will be more likely if your student has a more enjoyable behind the wheel driving experience. The benefits of commentary driving aim to reduce the stress, anxiety and tension that comes from traditional practice driving techniques. If you haven’t tried the commentary driving technique with your student driver, it is worth a try. It will lower both yours and your teen driver’s stress which will make for more enjoyable drives and a more confident soon-to-be driver. For your student to begin on-the-road driving lessons, he or she must be first enrolled in a driver’s education course at a state licensed driving school. 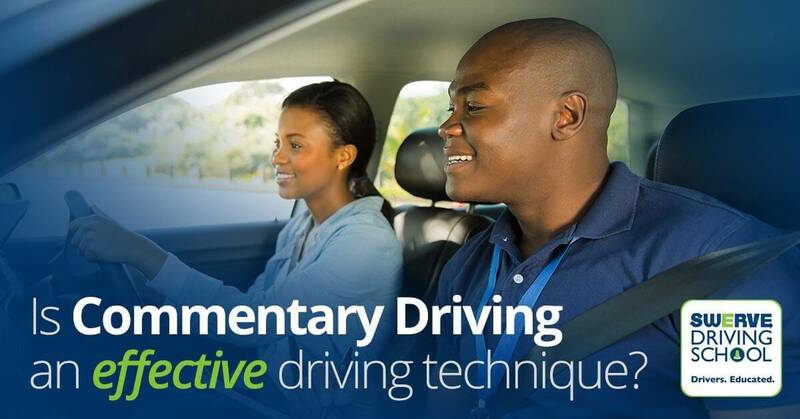 At Swerve Driving School, we help equip teen drivers to become skilled, safe drivers. For more information about our driver’s education, fleet training, or adult driving courses, contact us today.